PHOTOS: The Final Hours Of A Dakota Access Pipeline Protest Camp : The Two-Way On Thursday morning, law enforcement cleared out the Oceti Sakowin camp in North Dakota, ending a months-long protest against the completion of the nearby Dakota Access Pipeline. 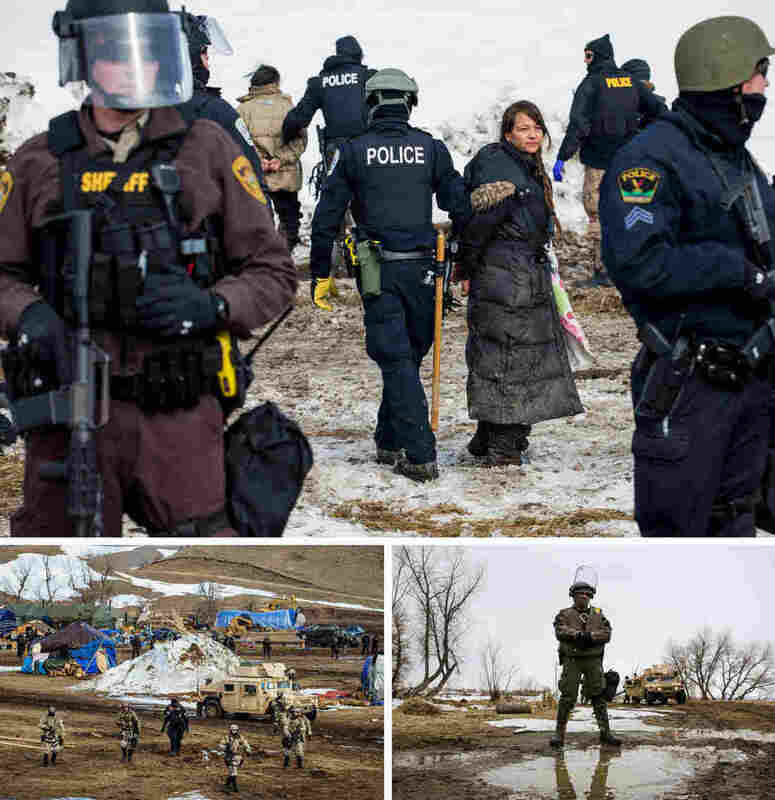 (Top) Police make arrests as they move through the Oceti Sakowin camp. 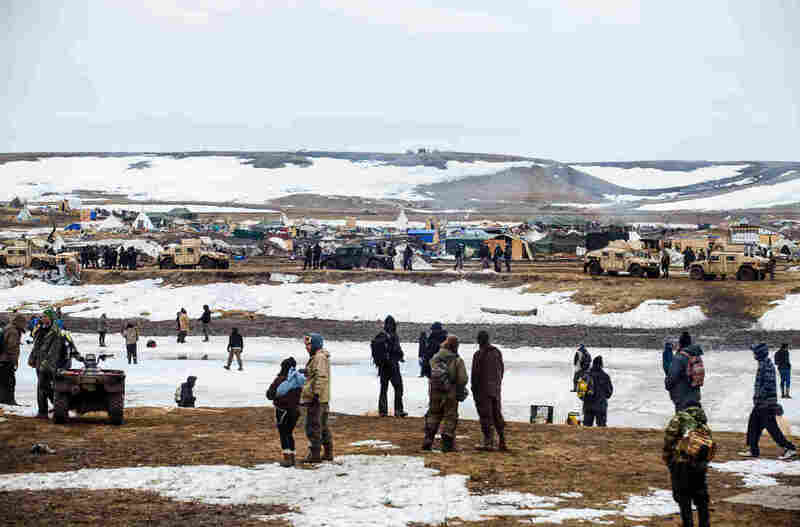 (Bottom) The police moved steadily and slowly through the camp, accompanied by Humvees and maintaining a perimeter of the cleared area. On Thursday morning, law enforcement entered the Oceti Sakowin camp to do a final sweep before officially shutting it down, ending a months-long protest against the completion of the nearby Dakota Access Pipeline. The Oceti Sakowin camp was the largest of several temporary camps on the northern edge of the Standing Rock Sioux Reservation in North Dakota. Protesters have been living on this land for months, in support of members of the Standing Rock Sioux. Supporters have said that running the pipeline under under a part of the Missouri River known as Lake Oahe would jeopardize the primary water source for the reservation, and construction would damage sacred sites, violating tribal treaty rights. The river crossing is the last major piece of the pipeline that remains unfinished. 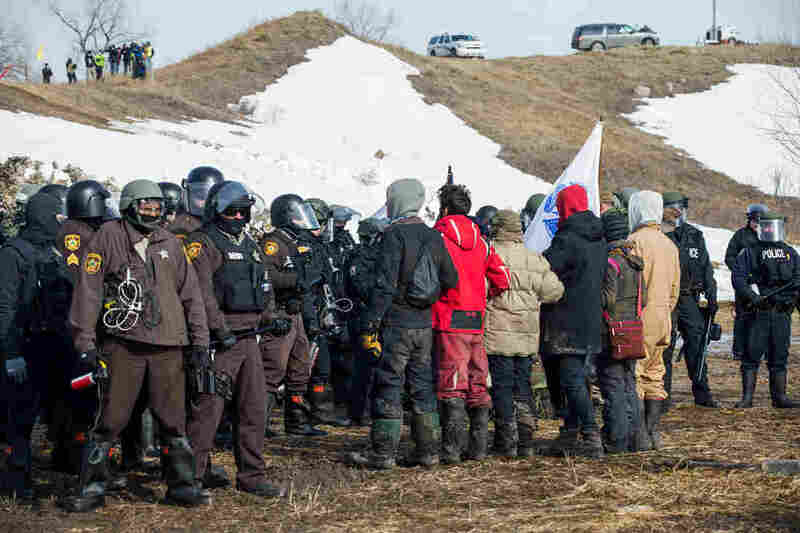 The North Dakota Joint Information Center reports that 46 people were arrested today. Others left the camp voluntarily throughout the day, according to a news release from the center. The arrests were nonviolent, though in several instances small groups of protestors stood peacefully in front of police lines until they were detained. Lt. Tom Iverson of the North Dakota Highway Patrol said that 200 police officers were on site, with officers from various North Dakota agencies, and others from as far as Alabama, Wisconsin, and Indiana. A line of officers, prepped with riot gear and supported by about a dozen Humvees, made their way slowly through the camp as the day wore on, checking every standing shelter, and arresting the people who remained. Citing flooding and safety concerns, North Dakota Gov. Doug Burgum had set Wednesday as the evacuation deadline for the camp, but after ten arrests and lengthy negotiations with protesters, police suspended the operation until this morning. As part of the effort to encourage people to leave, the state sent a bus to the site to transport people to Bismarck, where officials had set up a transition center, and offered hotel and bus vouchers. The governor explained that those who left willingly would not face charges. However, after only nine people used the center on Wednesday, it was closed today due to lack of use, according to state Emergency Services spokeswoman Cecily Fong. 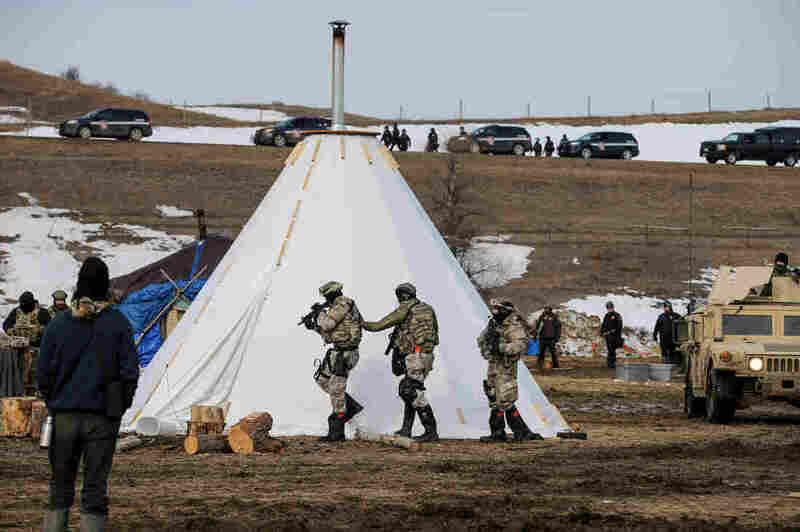 The Morton County Sheriff's department tweeted that camp was completely cleared by 2:09 p.m. local time, though afterward approximately 100 people stood on the opposite bank of the Cannonball River, singing and praying as police set up barricades to block off the site that had been the Oceti camp.